Formerly 39 Chrystie Street, (near Canal St.,) New York. Builders' Iron Work, Grating, Doors, Shutters, Sky & Vault Lights, Cemetery Railings, &c.
Fire Escapes, Cast Iron Columns, Girders, Lintels and Sills. Fire and Burglar Proof Safes made to Order. Adam Wagner, Charles Pfeiff, Residence: 17 Eldridge St.
Adam Wagner (ca.1835-bet.1887 & 1900) and Charles Pfeiff (1838-1917) started out together around 1866 at 86 Chrystie St., then were located at 39 Chrystie from 1868 to 1872, when they moved to 22 Eldridge St. Their last listing at this address was in 1885. At this point Pfeiff seems to have retired, and Wagner continued the business. The Adam Wagner Iron works continued at 22 Eldridge St. until 1895, when it became Adam Wagner's Sons, Iron Works. This business stayed at 22 Eldridge St. until 1902, when they moved to 86-88 Cypress Ave., at the corner of E. 132nd St. in the Bronx. In 1904 they became William Wagner Iron Works and stayed in business under this name until 1913. Charles Pfeiff applied for a passport in 1892, where he said that he was born in Darmstadt, Hesse, Germany, 11 April 1838, that he emigrated to the U. S. on the S. S. Teutonia from Hamburg, 21 April 1859, and that he became a naturalized U. S. citizen 9 Oct. 1866. The information on a passport application in 1894 was the same. At this time Pfeiff described his occupation as "gentleman." Adam Wagner appears in the U. S. Census in 1880, age 45, born Germany, living at 17 1/2 Eldridge St. With him were two sons, Adolph Wagner and William Wagner, who were the sons at Adam Wagner's Sons (1896-1904). In the 1900 U. S. Census Adam Wagner's widow, Elizabeth Wagner (born Germany, Nov. 1853), lived with Adolph Wagner (born New York, Dec. 1868) at what became the family homestead at 172 E. 93rd St., and William Wagner (born New York, April, 1873) lived with his wife, Louisa, at 337 Willis Ave., in the Bronx. Elizabeth Wagner died in 1917 in her 65th year. I have not been able to trace Adolph Wagner past 1900, but William Wagner, who took over the business on Cypress Ave., the Bronx, can be found in the three census reports for 1910, 1920 and 1930. In the last two of these he lived at 2936 Bainbridge Ave., the Bronx. The 1880 U. S. Census recorded Wagner & Pfeiff as owning $25,000 of real capital and $31,000 of raw materials. It employed from 28 to 40 men at annual total wages of $15,000. Manufactured products and services in the preceding year were valued at $52,708. 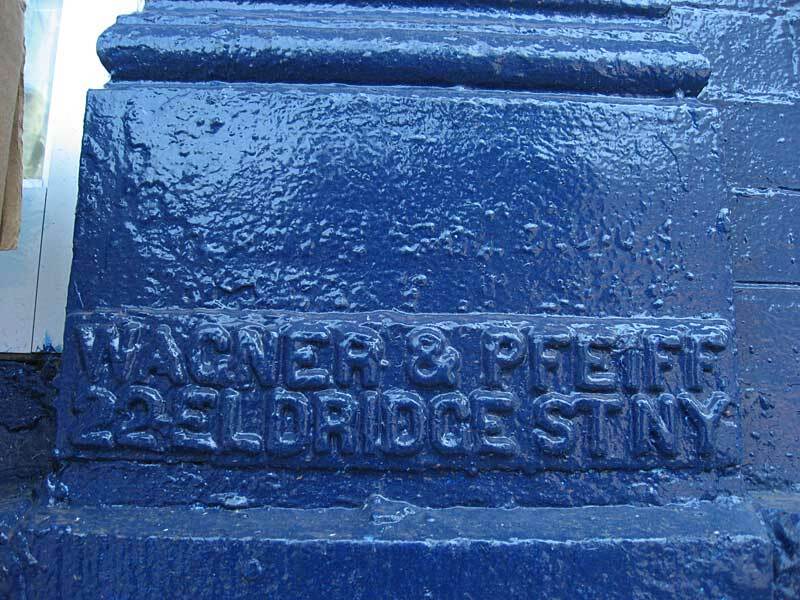 Other Wagner & Pfeiff foundry marks are found at Walker's (corner of Varick and N. Moore Sts. ), one blocked by a pole and another beside the front entrance. Yet another Wagner & Pfeiff is found on the corner of West 10th St and West St. (393 West St.). This is heavily painted and hard to read, and Pfeiff seems to be spelled PFIEFF. A coal chute cover labeled Adam Wagner is found in the manholes section.